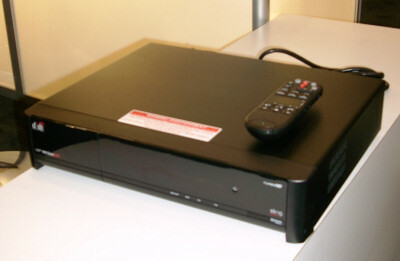 At CES 2009, EchoStar previewed a new 1 TB HD DVR with an integrated Slingbox. Combining TV and IP technologies, the DVR will include a touchpad remote control, RF support, and brand new, tile-based user interface. "We've never had anything like this before," , said Tony Kozlowski, senior product manager, showing off the new EchoStar SlingLoaded 922 HD DVR in the EchoStar booth at CES on Sunday afternoon for Betanews. The box is designed to let you view and manage TV shows from just about anywhere through a broadband Internet connection via a laptop or mobile phone. Betanews saw how the rear panel of DVR's black chassis includes ports for satellite input; RF antenna; home distribution; TV2 composure; TV1 composure, TV1 component; Dolby digital optical output; HDMI; USB; and a phone line. The product's 1 TB hard drive supports up to 1,000 hours of stored video. Users can also connect external drives for additional storage, according to Kozlowski. Use of a touchpad on the remote eliminates the need for half the buttons typically included on a remote. EchoStar plans to release the new HD DVR this spring, Kozlowski said.